Valuable commodities have volatile pricing, and when a certain commodity is in demand due to a recurring need, a company may issue a Purchase Order (PO). 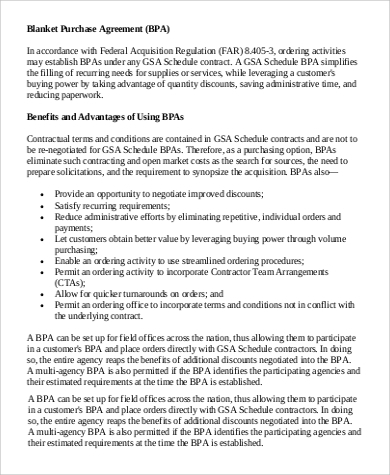 The purpose is to enable a blanket purchase of goods to take advantage of prearranged pricing and special discounts offered by the Blanket Purchase Agreement (BPA). It’s part of a company’s policy of forecasting to prevent it from being caught off guard and not upset the budgeting for the goods when there’s a sudden change of price. Our Sample Agreements on blanket purchase will help customers and suppliers alike craft an agreement to supply goods at a predetermined price. 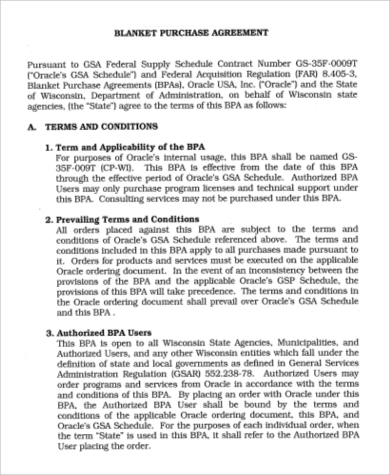 The BPA comes with a couple of sample forms that can be edited and modified before filling in the details of the agreement. 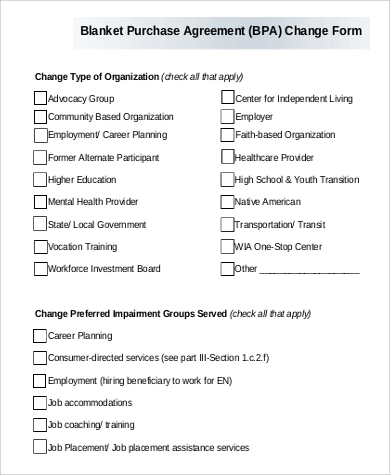 These are available in both Word Doc and PDF file. Besides the possibility of volatile pricing, some companies’ warehouses are filled to the brim and they need to consume the stocks before being able to receive new inventories. By having a Blanket Purchase Agreement in place, the company doesn’t have to hold more stocks than are necessary, thereby freeing its warehouse to accept other relevant stocks for its production purposes. It can also free the company of having to issue purchase orders every now and then. One advantage of a blanket order is that the commodity being purchased is set at a fixed price. A fine example would be a shipping company. A ship needs both diesel and bunker fuel to operate. Since the prices of both kinds of fuel are highly volatile and can change week after week, it would be advantageous for a shipping company to order its fuel needs from its supplier based on a Blanket Purchase Agreement. This is so that the shipping company will not incur heavy losses should oil prices suddenly shoot up at a greater price than what they were before. 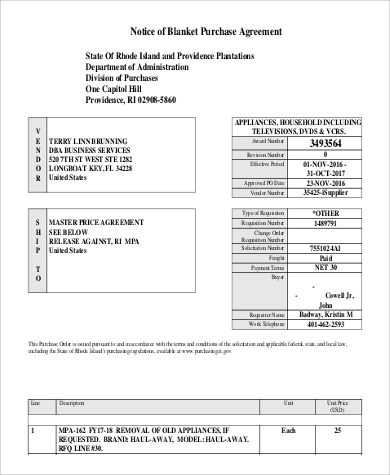 Besides Blanket Purchase Agreement samples, we also have free downloadable Stock Purchase Agreement Samples. These are for those who are willing to transfer ownership of stocks under a stock purchase agreement. These are also available in both Word Doc and PDF file formats. 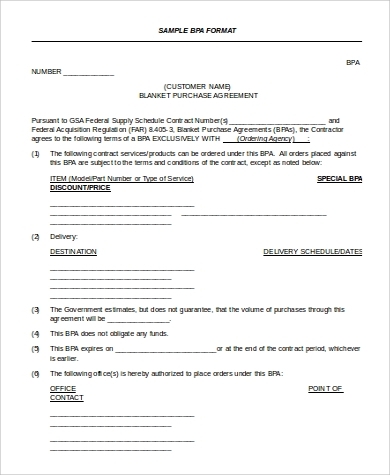 A Blanket Purchase Agreement not only benefits the buyer but also the supplier. In essence both parties have beneficial advantages to the agreement. 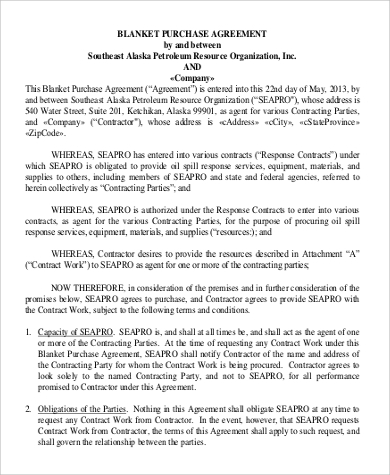 For one, both parties are ensured of the buying and selling aspect of the agreement. For the buyer, sudden changes in pricing will prevent a catastrophic budget imbalance that can be disastrous from a financial point of view. 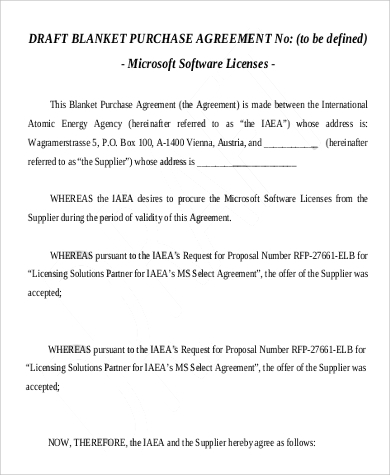 For the supplier, he is assured that his product will not go unsold as the agreement assures the product will be paid for on an agreed quantity. 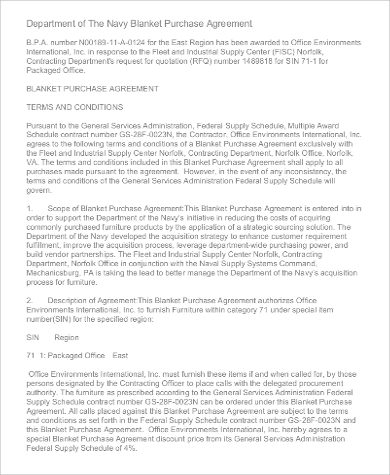 For those looking to craft an outline of a sale and purchase of company assets, our Asset Purchase Agreement Samples will come very useful for both parties to the agreement. 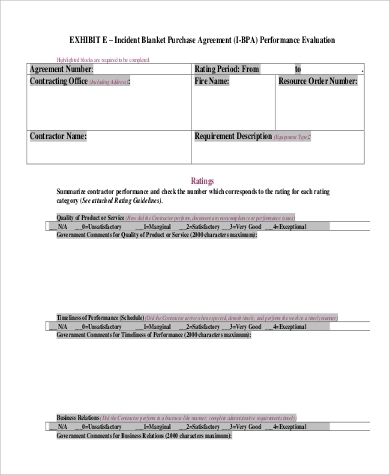 The samples come with terms and conditions, which can be edited or modified according to the terms of each party’s agreement. These are also free to download and are available in both Word Doc and PDF files.